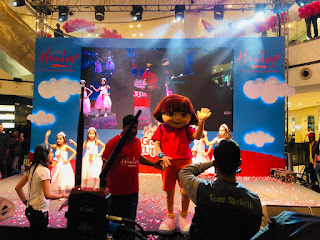 Noida : January, 2019: Hamleys-‘The Finest Toy Shop in the World’ opened doors of its flagship store to welcome customers to a whole new magical experience. The iconic grand parade from Regent Street, London was recreated for this occasion. The entire three hour extravaganza involved thirty two popular kids’ characters from across the globe. Thousands of kids and parents gathered at DLF Mall of India, Noida to witness the grand event which made the evening magical for everyone. There was excitement in the air as the people were euphoric with what they had witnessed. International characters were joined by the Hamleys family who broke into an enthralling performance, dancing their way through the crowd and engaging with children. The international characters that added to the merriment included Tom & Jerry, Peppa Pig, Masha & the Bear, My Little Pony, Johny Bravo, Doreamon, Shopkins and more. The Hamleys store has been remodeled on the concept of Hamleys Playroom which includes an exclusive play area for children along with an amazing Mirror Maze experience. There is also a café located inside the store for parents to take a break while the children enjoy the Hamleys experience. Hamleys is known for the unique in-store magical experience it provides to both children and parents. The new store promises to take that experience notches higher and set a benchmark for the upcoming stores. For 258 years, Hamleys of London has been The Finest Toy Shop in the World bringing magical experiences and joy to children of all ages. Hamleys’ rich history began with William Hamley, a Cornishman from Bodmin, England. William Hamley dreamed of the best toy shop in the world when opening his toy shop at Holborn, London in 1760. In 2018, Hamleys, as a global brand, extends significantly further than the famous London toy shop. With over 118 toy shops worldwide. Hamleys, in India, has grown to be recognized as a trend setter for new and magical experiences for children. The brand has 75 stores spread across 32 cities in the country and is growing.